On this advertisement I offer you a self-catering seaside one bedroom apartment called, Apart Sabine RUSELO R408, in Torrox-Costa (NERJA), south facing (sun all day), with a panoramic view of the Sea through the huge (180º ) windows from the floor to the ceiling,which takes the full width of the apartment.View of the sea, the beach and the beginning of the coastal promenade (2km) of Torrox-Costa. Beach and sunbathing lovers will be able to laze in the sun, on the beach which is 30meters away from the apartment, or to go to the secured swimming pool with garden and solarium. Perfect location for day trips: Granada, Cordoba, Ronda, Seville, Gibraltar, Málaga, Tarifa...Car not needed. Close to all amenities. Fly to Málaga Airport, Torrox-Costa is 40 min drive by motorway. Special rates for retired people for winter long let.Pets are not allowed. Send me an email and I will get back to you with more pictures, VIDEO, details, information on the region, etc . Bus good connexions. Do not miss the sunrise & sunset in the apartment. Situation details: The Ruselo R4 apartment is right next to the ruins of Roman baths. The area of Torrox is made up of three areas. Torrox Pueblo is the old white washed town in the hills, Torrox Park a newish Urbanisation on the hill and Costa the actual coastal area. The costa stretches some three Kilometeres and has a very long prom (Paseo) that is well paved with bars and restaurants. This is very much a family resort and not full of drunken groups. The months of July and August is when the Spanish from the North decend on Torrox for their vacation. The paseo comes alive at night with all ages taking time out together with street entertainers and market stalls open till the early hours. Every taste is catered for in the food on offer from the beach grills, chinese, Indian and more traditional Spanish Fayre. On the beach, there are plenty of water sports available and the sea is clear and clean and a lovely temperature during the summer months. The weater all year round is mild with the winter months still pleasant during the day and evening temperatures cooler. The summer months do get hot, but little humidity and a sea breeze makes it all very pleasant. Hello, welcome in my advertisement. My name is Sabine and with my Spanish husband, we are owner of this accommodation seaside. I am Belgian but I live in the Costa del Sol for many years. I felt immediately in love with this part of The Coast, the kindness of the people and the weather here in Torrox-Costa that is called ' the Best Climate of Europe' and I would like to share it with you in renting my apartment in this place. When I got inside the first time in the apartment, I was seduced by the sight of 180 º C on the sea view from the windows up and down. The view took me breathless, south facing, sun shining all day with beautiful sunrise and sunset. The perfect place well situated, the beach at the foot, no car needed (Park your car and you can forget it), all shops close at hand, the bus station and taxi at 2 steps. I could walk by the sea with beach bars in the evening, coffee, swim, sunbathe but I found it is the perfect location to make day visits to Granada, Cordoba, Ronda, Seville, Málaga .. Moreover, this apartment has been so successful that it is reserved some dates a year in advance and even some tenants repeat 2 times their stay. It's great to get up in the morning, open the curtains and see the sea from your bed, without vis-à-vis, as if it belonged to you. You can choose breakfast in bed sorry but the hotel service will be made by one of you, or at the dining room table. The inside of the apartment is warm and welcoming color, it is equipped and we take special care for its maintenance in order to offer you a pleasant stay in a privileged environment with warm and at the best possible price. 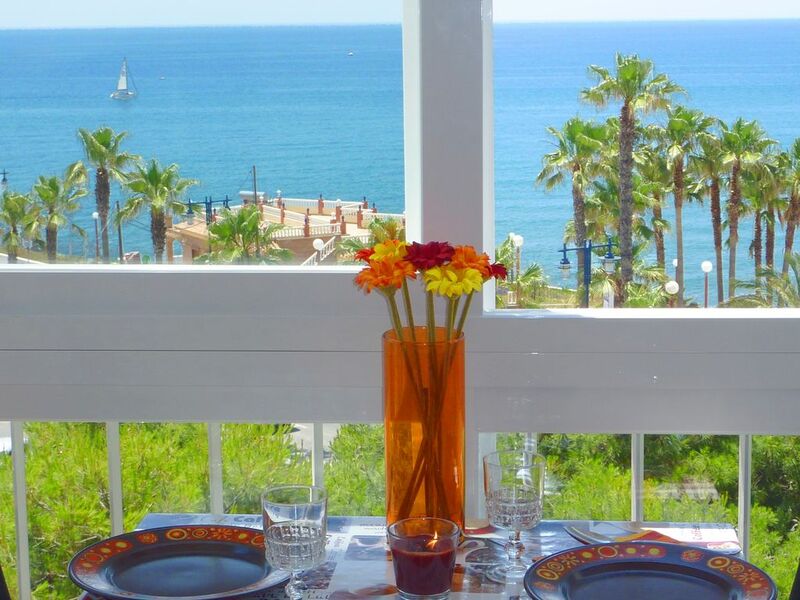 The dining room is the perfect place to relax and enjoy the beautiful sea view. Your breakfasts, lunches or dinners will be a real pleasure for your eyes. The windows, double glazed and with shutters, take the full width of the apartment and can be opened wide to allow total ventilation or to permit you to sunbath. Free outstanding view of the sea, not overlooked, and the blue of the sea is the main colour of the scenery, the sandy beach and the promenade. From this apartment you can see, in winter, the breathtaking sunsets on the sea, different every day. The swimming pool is shared and always secured by a life guard (open in high season). Admission only with a card, which will be handed to you upon arrival. Around the swimming pool, there is a fully fenced garden to sunbath. Torrox-Costa is a seaside resort open all year long by the sea, with a lively promenade, very attractive, very easy to reach for the youngest and people with limited mobility. As popular early in the morning for the sportsmen's training (possibility to jog by the sea along 4km at least) as at nightfall for families wandering around the souvenir shops. The promenade is even, perfect for bicycles, skateboarding or roller skating and you will find at least 30 restaurants and terraces, pubs, ice-cream parlours, boutiques, clubs, tourist information office, children playground, outdoors body building machines, beach soccer pitch and basketball court. Activities: petanque, fishing, hiking, jet skiing, cultural sites, water sports, golfing, horse riding, theme park, windsurfing, cinema, scuba diving, sailing boats or sea trips, mountain biking, Jeep safaris, water park, canoeing, quad Biking, motos, bikes, scuba diving, etc..
Lovely compact apartment. Very well equipped. Stunning views from the full length south facing windows. A joy to open the blinds and curtains every morning. Fabulous location at the start of the paseo. Near to restaurants, supermarkets and beach. Very efficient ceiling fans although air conditioning would be needed in the summer months. Sabine the owner was very efficient. A thoroughly enjoyable stay. Our hostess Sabine was helpful and friendly. Apt. was spotless - exactly as photos. Excellent wifi; washer/drying rack for laundry, comfy bed, well equipped kitchen plus a very nice view of the sea. Grocery stores and many restaurants nearby. We fell in love with Nerja, a lovely 15 minute drive along the shore. Dinner at The Hotel Jardin accompanied by flamenco guitarist was excellent. A half hour drive takes you to Frigiliana, a sparkling mountain town. I heartily recommend Sabine's apartment to anyone visiting the Costa del Sol. Thank you for your kind review. I am very happy you enjoyed the accommodation and the surrounding. It is true that the accommodation is very well located for people wanting to dicover Andalousia, and cities like Sevilla, Córdoba, Ronda, Granada, Málaga. etc.. or just relax close to the beach and Mediterranean sea. I will be so glad so see you again, it was a pleasure to meet you. Thank you for your review. It was a pleasure to meet you. You are very nice tenant and you take good care of my accommodation. I hope to see you soon. Muchisimas gracias por haber elegido y haber cuidado también de mi apartamento. Ha sido un placer conoceros y me dio mucha alegría coincidir con ustedes en el bonito pueblo montañero: Frigiliana en su fiesta de fin del mes de agosto de las 3 Culturas. Praktisch gelegene Ferienwohnung mit allem nötigen Komfort. vom Bett aus über dem Meer aufgehen und abends über dem Meer untergehen. Thank you for your review. I was very happy you enjoyed your stay. This apartment Ruselo R408 is very nice view and situation on the COSTA DEL SOL. The location is perfect, near the beach and all amenities closed by. No car need, but if you come by car , there is plenty of space. See you soon. It was a pleasure to meet you. * Torrox-Costa is located between Nerja and Torre del Mar, surrounded by a range of mountains at its background which prevents cold winter wind. The summer breeze refreshes the night in the summer. That is why Torrox-Costa is well-known by having “ THE BEST CLIMATE IN EUROPE” ( over 330 sunny days per year!!!! ), with daily temperature in winter from 15º to 20ºC. * Getting out the apartment, you have access, to the flat coastal walk of 2,5km long and sandy beach "Playa Ferrara. The beach, with its Blue Flag from the European Union, with his "chiringuitos" ( beach restaurants ) and "tumbonas" ( sunbed directly on the sand ), totally secure, with lifeguards ( seasonal ) and showers. * There are 5 big supermarkets like: LIDL, ALDI, SUPERSOL, DIA et MERCADONA, restaurants "chiringuitos", banks ( at the top of the street) , 24 hours open pharmacy, doctors / nurse ( small private clinic 24hrs emergency ), dentists, bus stop ( 200 meters ), taxi stop, pubs, hair dressers, newspaper saler, petrol station, baker , rent a car, laundry, and the small market down the building for groceries open Sunday morning with good fruits and vegetables), etc. There are plenty of local supermarkets and a good selection off restaurants on the Prom with Spanish, English, Italian, German and Chinese cuisine. * Perfect for sport people, biking, etc. Torrox-Costa has a long coastal promenade which runs the length of Torrox Costa resort with a choice of excellent restaurants, typical Spanish bars, terrace bars, pubs, shops, street vendors ( seasonal ), Tourist office, outdoors fitness equipment, runway beach soccer and basketball for free use given by the City Council, Tourist Office. This region is a very well know tourist area famous for it's climate, cosmopolitan life styles and history. A typical Spanish market is held every Monday morning. * Torrox-Costa: The Costa del Sol is one of the most popular destinations for holidays having a temperate climate, it is popular with sun seekers the whole year round. * BEACH: 30 meters from the "tumbonas" , depending season you can rent them. * BUS station: 2 minutes walk. Frequent buses to all locations. * Sierra Nevada SKIING RESORT, which has hosted world cup events, 1hr 30 min. * French border by Irún: 1000km Ferry ports at Santander/Bilbao approx 600 miles, 10 hrs by car. - Taxis are always available. A single journey from Malaga Airport to Torrox will cost approx 60 / 65 Euros and take around 40 minutes. We would strongly recommend pre-booking a taxi to avoid being over charged at the airport. - Car hire: All major car hire firms operate from the airport. A hire car is optional. NO CAR NEEDED IN TORROX COSTA. All is easy walk. - Bus: There is a regular / excellent bus service from the airport to Málaga and every hour from Málaga to Torrox-costa. Taking the Mediterranean motorway A-7 ( AUTOVIA DEL MEDITERRANEO towards “Motril – Almería “ or “ Algeciras” ) you take exit number 285 and you get down to the sea. * If car, there are free parking space in the surrounds.